Each of these parts handle a different function to ensure the commercial kitchen stays well-ventilated and 100% safe. All of them must work in concert for your kitchen to work smoothly. When you partner with Flue Steam, we’re always happy to answer any questions you may have about your commercial kitchen’s ventilation system and how to optimize its performance. 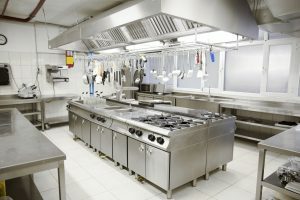 Making sure your ventilation is always in perfect working order and condition is absolutely essential so that your commercial kitchen is constantly safe. Flash fires are disastrous in commercial kitchens – not just because the of the serious risk of injury and damage to property, but because your business looses precious time when the fire department has to be called, damages have to be repaired, etc. Schedule regular kitchen exhaust cleanings with Flue Steam, and you’ll never have to worry about when you’re going to take care of this cumbersome chore again. Your exhaust system will always be free and clear so you and your staff can focus on other essential aspects of keeping your commercial kitchen running smoothly. Call 800-700-FLUE to discuss all our services with a friendly, professional member of our staff, and determine which ones would be the most helpful for you. Or if an emergency need arises, we’ll be happy to take care of it right away when you call 800-700-FLUE. One of our technicians will be right over to make sure your problem is addressed so you can get back to normal operations ASAP. When you’re managing a commercial kitchen, we know that time is a top commodity, so our technicians work efficiently to resolve your issue immediately. Count on us for all your commercial kitchen ventilation and fire prevention needs throughout Southern California. We’re here for you anytime 24/7 – just call 800-700-FLUE for immediate assistance.